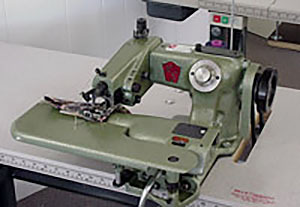 Bill's Sewing Machine Company has a complete line of new and used industrial sewing machines for the basic drapery workroom. 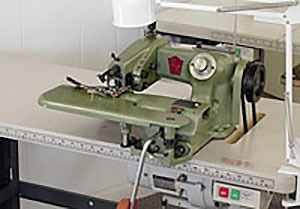 Most drapery rooms require a (4) four machine set-up consisting of (1) one straight stitch or straight and zigzag machine (1) one blind-stitch machine (portable or industrial) (1) one (4) four-thread mock safety Serger, and (1) one Ruffler. Bill's also has a full line of accesories including all sorts of feet, scissors, rulers, needles, bobbins, and all other parts for the machines we sell. 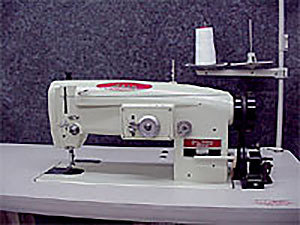 Call Bill's for your sewing needs and be sure to check with us on our used machines. The APEX DT-1 sewing machine has been modified to accept the thick drapery pleats up to 5/8 of compressed material. Higher presser foot lift and longer needle makes the sewing of thick pleats easier. With the simple change of a foot, rings can be attached to balloon valances. The optimum-balance and highly rigid machine head were created using the latest 3D-CAD design technology. Thanks to its low vibration and low noise feature, the machine head provides the operator with a comfortable work environment. In addition, the distance from the machine arm to the needle on the front of the machine head is sufficiently wide to allow easy handling of the sewing material. 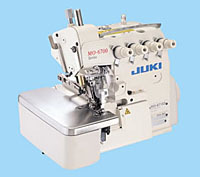 The machine inherits the desirable features, such as high-speed stitching performance 5,500rpm, extreme stitching performance, ease of operation, and reliability, from the highly evaluated previous JUKI lockstitch machines. Four Thread True Safety Stitch Using Two Needle and Two Looper Threads Stitch combines Fed. Class 401 stitch with Fed. Class 503 stitch. Typical uses; Overedge Stitch for Seaming Knits or Wovens Stitch has a medium bite and Moderate Stretch for Seaming on Knits or Woven Fabrics. Stitch has medium elongation along the edge of fabric. 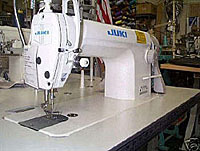 This machine has been totally refurbished to new specs., it is capable of sewing light sheers to heavy drapery fabrics. Suitable for operations requiring a skip stitch. The US718 Blind-stitch is ideal for drapery rooms, alteration rooms, dry cleaners, and industrial mfg. plants. 1 to 1 non-skip stitch and 2 to 1 skip stitch. 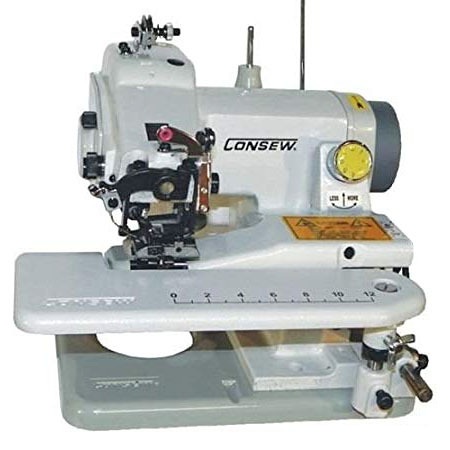 This is a light weight compact and fully portable blindstitch machine for sewing all types of light to medium fabrics, typical for hemming pants, dresses, skirts, draperies and undergarments. It is ideal for the workroom with limited sewing space available. Bill's Sewing Machine has a full line of parts and feet specifically for the drapery industry.